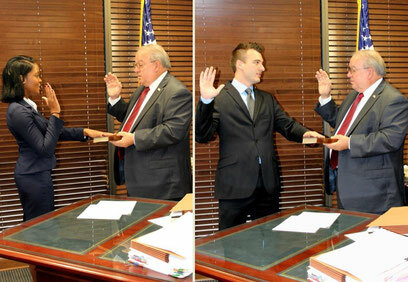 Calcasieu Parish District Attorney John DeRosier recently swore in two new Assistant District Attorneys. Bethany Allyce Blackson joins the staff as the new Child in Need of Care Attorney. Blackson is a proud native of Winnsboro, LA where she attended Franklin Parish High School. She went on to receive a Bachelor of Arts Degree in English and Sociology. During her time at LSU, Blackson was named a Ronald E. McNair Research Scholar. After graduating, she received her Juris Doctor from Southern University Law Center where she served on the Student Bar Association as Secretary. Blackson also served as a student attorney for the Juvenile clinic and was inducted into Phi Alpha Delta Law Fraternity and American Inns of Court. She will join the District Attorney's Office Juvenile division. Charles "Dustin" Strauss also joins the staff at the District Attorney's Office. Strauss was raised in Hackberry, LA before pursuing his undergraduate education in Political Science from the University of Louisiana at Monroe. He then obtained his Juris Doctor from Stetson University College of Law. While in law school, Strauss was an active member of the trial team. He has a passion for trials and public speaking, leading him to pursue a career in prosecution. Prior to joining the staff, Strauss was a personal injury attorney. He will now serve as a Misdemeanor Attorney for the 14th JDC and Ward 3 City court.